Navitor Specialty Products (NSP) is launching three new stamp options that will give customers new variety in their stamping needs. The MINEⓇ textile stamp has a durable and lightweight base and is designed for marking fabric, leather, wood, or any other porous material. Common uses include marking clothing in daycare, nursing home, healthcare, or industrial environments. 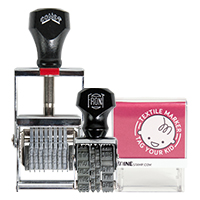 This stamp uses rapid dry ink and is extremely wash resistant. The Pullman Traditional Stock Dater and Numbering Stamp pairs long lasting rubber with an industrial grade metal body to create a stamp that won’t tire out. Water based ink stamp pads are recommended for this dater and number stamp to ensure its longevity. The Comet Self-Inking Stock Dater and Numbering Stamp features a heavy duty steel frame that allows you to quickly and efficiently mark documents, forms, and more. The ink pad is built right into the stamp to make it self-contained, long lasting stamp.